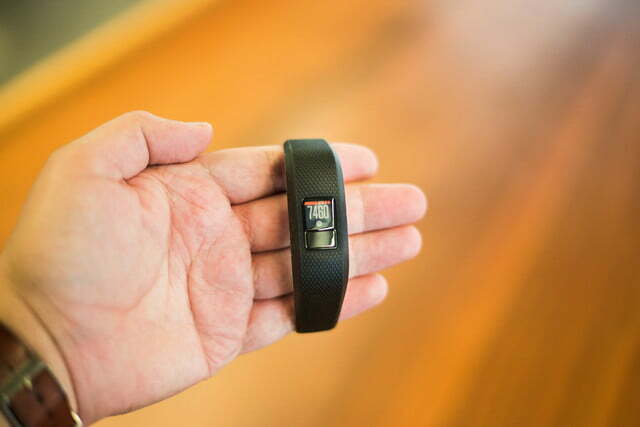 The Vivofit 3 is a solid, simple fitness band that tracks your steps well at a good price. In a kinder, gentler, earlier time we didn’t ask much of our fitness bands. If they could count steps, estimate distance travelled, and extrapolate a caloric burn rate that was enough. We didn’t require that they stand up to rigorous scientific tests questioning their accuracy or effectiveness, and we never thought of saddling them with trafficking incoming phone calls or displaying text messages in hi-def color. We slipped them on our wrists and used their data to make sure we kept our bodies moving. Garmin’s Vivofit 3 is a return to those simpler fitness band days with a few substantial upgrades. The Vivofit 3 is made up of a small, removable tech module and a silicone band that wraps around it so snugly that it seems to be one piece. The module, which is water resistant to 5 ATM, features a 64 x 64 pixel display that is .39 of an inch square. Beneath the screen is one solitary button which Garmin gets serious use out of. Repeatedly pressing the Vivofit 3’s button scrolls the display through time, date, number of steps, steps remaining to goal, distance travelled, and active minutes. A press with a short hold turns on the backlight, a press with a medium long hold starts an activity. Hold it a little longer and it forces the Vivofit 3 to perform a sync with a paired smartphone. Longer still and the “pair” icon appears. Don’t let up on the button at all and an “about” screen appears displaying current firmware numbers. On the back of the module are four screws that can be removed to replace the battery that Garmin says will keep the Vivofit 3 for a year before it needs to be changed. Because the brains of the device are modular, the Vivofit 3 can be easily removed from the band and slipped into an activity belt clip (purchased separately). This design also makes it easy to switch the module into any of a rainbow of optional band colors and designs, including the fancy Alexandra sculpted bands and signature colorways from designer Jonathan Adler. The Vivofit 3’s display can also be customized, a bit. The screen is small, but there are five different watch face settings to choose from: digital time, digital time with reversed minutes, time with an activity progress bar, and two different versions of an old “big-hand-little-hand” analog watch face. In split screen mode, the screen displays digital time, the move bar, and then any one of the other metrics displayed below it. The Vivofit 3 has one audible alarm that can be set to any combination of days, however, it does not have a vibration alert. Our favorite function on the Vivofit 3’s is its ANT+ heart rate monitor compatibility. For activity tracking the Vivofit 3 can record walking, running, cardio, and cycling as well as monitor sleep time and quality. With Garmin’s Move IQ activated the Vivofit 3 will automatically tag activities. Activities are recorded on the device then synced via Bluetooth to a paired compatible smartphone running Garmin’s free Garmin Connect smartphone app. Where the Vivofit 3 jumps ahead of other simple fitness bands is with heart rate. 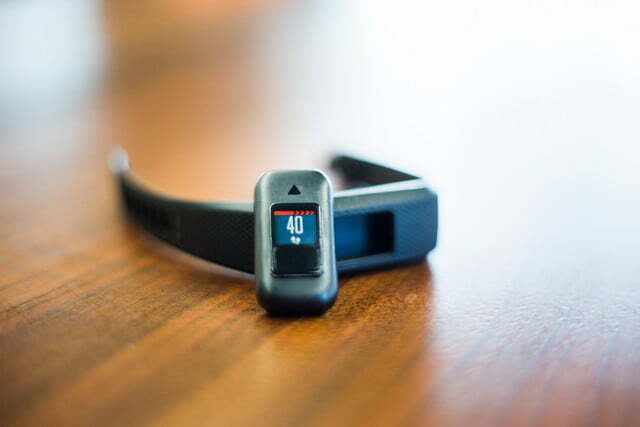 The Vivofit 3 does not have a built-in heart rate monitor, but it can connect to any compatible heart rate monitor using Garmin’s ANT+ wireless communication protocol. When paired with a heart rate monitor the Vivofit 3 will display heart rate and heart rate zone and record those metrics during activities. The Vivofit 3 arrives with the fitness band and a quickstart guide. There is no cable included because with a one-year battery and Bluetooth connectivity there is no need to plug it in, ever. 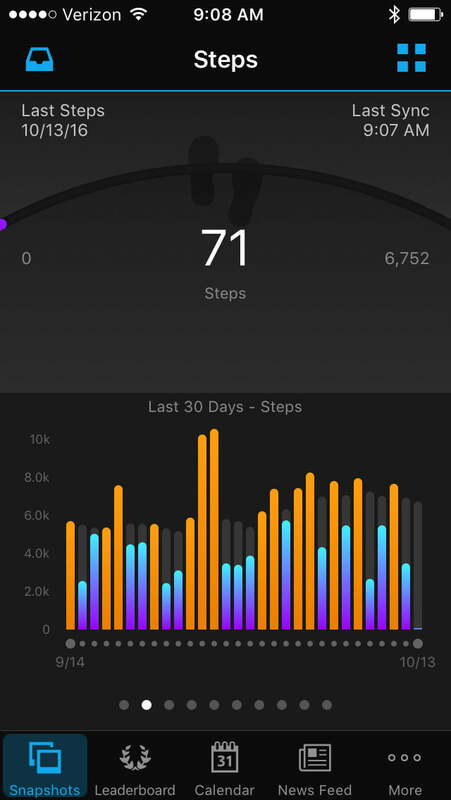 The Vivofit 3 can track metrics right out of the box without first being paired with a smartphone or computer, but the metrics get reset each day and there’s no way to look back on previous days’ results. The best way to use the tracker is by pairing it with the free Garmin Connect smartphone app which is available for Android and iOS devices. After downloading the free app users are guided to create an account on Garmin Connect. This is done by entering and email and password and answering a few personal metrics questions like gender, age, height, and weight. Once the account is created it can be accessed both on the smartphone app and on Garmin’s Connect website. 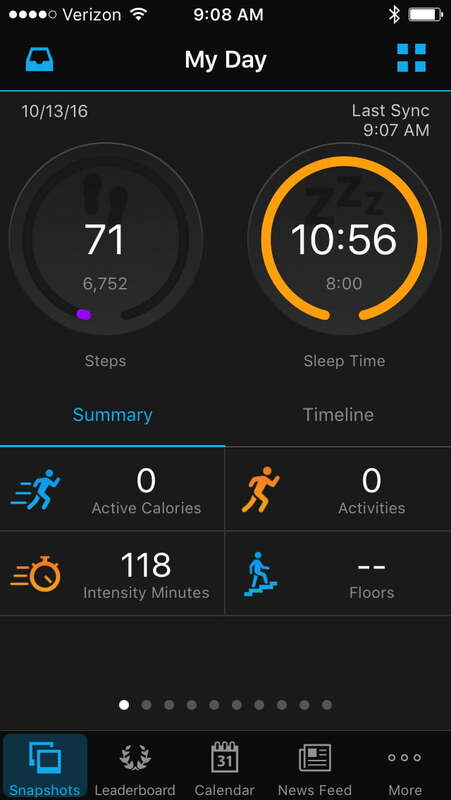 Pairing the vivofit 3 to the phone requires tapping the “more” button in the lower right hand side of the Connect app and selecting “Garmin Devices.” At the bottom that screen is a blue box with the words “Add Device.” Once Vivofit is selected the phone begins searching the band. That’s when the button on the Vivofit 3 should be held until the word “pair” appears and then released. After that the Vivofit 3 ready to do its thing. 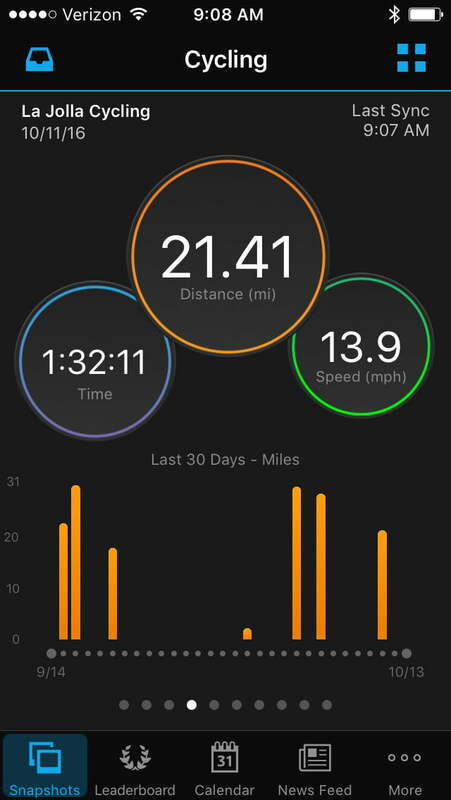 We wanted to see how the activity would appear in Garmin Connect so we made sure the Connect app was running on our phone and then pressed and held the Vivofit 3’s button until the word “sync” appeared and then quickly released it. When the sync was complete it was obvious that Move IQ had some trouble detecting our activity. It tagged our effort as 15 minutes of cycling followed by an hour and 15-minute walk. Apparently, the road we’d ridden was not consistent with the Move IQs model for cycling. Because of this we had to manually edit the activity on Garmin Connect as a 90-minute ride. We weren’t all that surprised. The Vivofit 3 doesn’t have GPS and, while the Garmin Connect app is location aware, it doesn’t track activities on its own. This means the Vivofit 3 is left to calculate walking and running distances based on steps and strides. 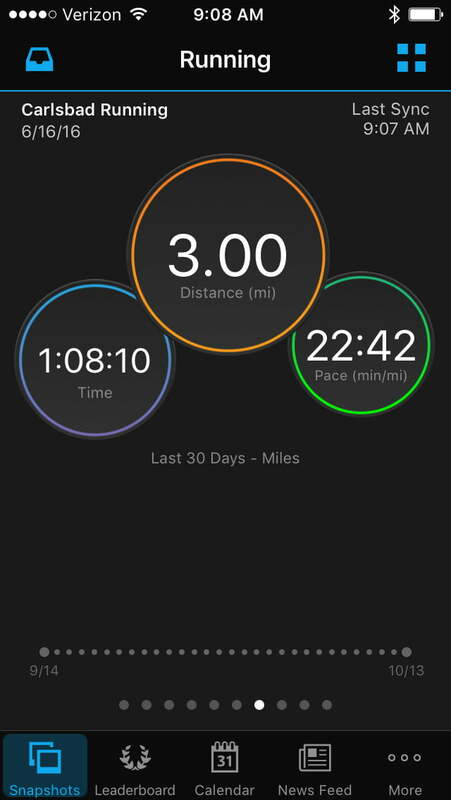 We wondered how accurate that could be so the next time we went running we wore both the Vivofit 3 and a GPS watch and found the Vivofit 3 surprisingly accurate on distance on walks and runs when compared to the GPS watch. 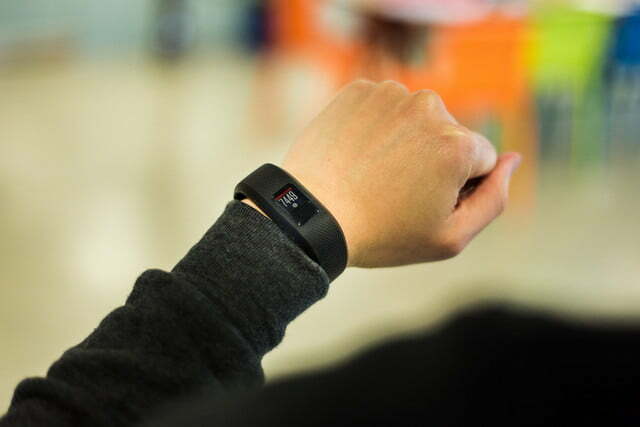 Our favorite function on the Vivofit 3’s is its ANT+ heart rate monitor compatibility. 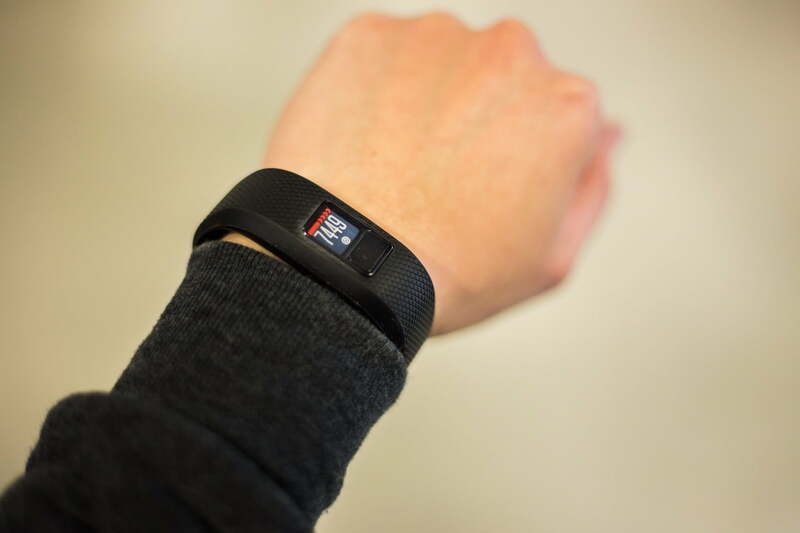 Once the band is paired with an ANT+ heart rate monitor the Vivofit 3 can display heart rate and heart rate zone. The catch is that it only saves the heart rate data during an activity. After it’s been synced with Garmin Connect, it is easy to analyze the workout with a graph of heart rate over time. The Vivofit 3 was surprisingly accurate on walks and runs. One thing we’ve come to depend on with fitness bands is their alarms. The Vivofit 3 has one programmable alarm, but it does not vibrate. It uses an audible chirp almost identical to the sound made by a smoke detector with a low battery. It’s not loud enough to be annoying, yet often not loud enough to be heard above the din. Indoors, in a quiet room it works fine, but anywhere there is noise you have to struggle to listen for it. The other downside is that, while there are settings on Garmin’s Connect smartphone app to allow setting the alarm, they don’t currently work. 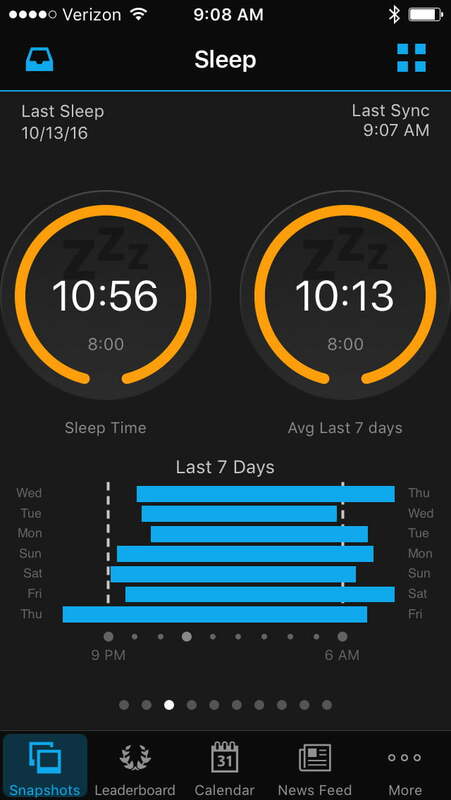 For now, setting an alarm on the Vivofit 3 requires visiting the Garmin Connect website, setting the alarm, and then syncing the device — not exactly something that can be done from bed moments before falling asleep. Garmin says its engineers are working on a fix that should be done soon. Then there’s that single button. It seems simple enough, but can sometimes be problematic. Occasionally, while trying to start an activity we’d instead begin a sync and there was no way to stop the sync until it finished. Other times we’d start an activity when we meant to sync. It wasn’t all that confusing it just took a while to adjust. The Vivofit 3 is a solid, simple fitness tracker that does the basics well. After wearing a GPS powered do-everything watch for the past year, it was refreshing to return to a small, light fitness band that wasn’t continually interrupting us with vibrations, text messages, and phone call alerts. We realized that sometimes we just want to count steps, or check on our sleep patterns without having a big smartwatch on our wrist. For $80 – $100, it comes at the right price, too. Garmin isn’t the only company making simple fitness bands. Fitbit has two comparable products — the Flex 2 and the Alta — but the Flex 2 has no screen at all (making it impossible to tell the time) and the Alta isn’t really water resistant, not to mention being $40 more expensive. Neither of them will connect to a heart rate monitor, either. The Vivofit 3 will continue to do what it does for the foreseeable future. Removable bands mean that a torn band, or broken latch won’t mean the device’s demise. Garmin has also been extremely good about updating firmware and apps that allow their devices to stay current. Yes, if you’re looking for a fitness tracker that keeps things simple you’ll find great value in the Vivofit 3, but there are a couple things to think about. With no vibrating alarm or any smart notifications, it can’t keep you quietly notified and the audible alarm can’t be set using the smartphone app. If those three functions are important, then you should definitely look elsewhere. On the other hand, if you like the idea of a simple fitness tracker that can be paired with an ANT+ heart rate monitor zone, you should definitely buy the Vivofit 3. 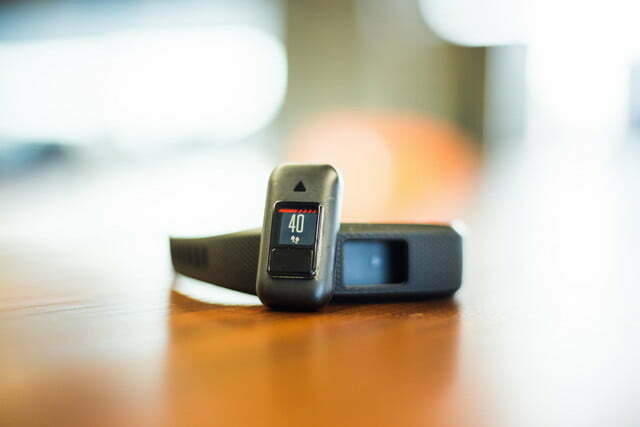 Above all else, it is a great, inexpensive way to enter Garmin’s enormous sports and fitness tracking ecosystem, one that we think is the best currently available.